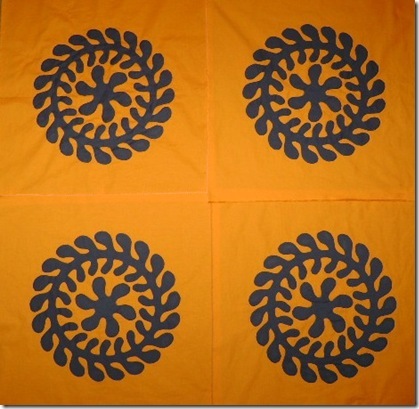 Kathie from Inspired by Antique Quilts asked me last night if this pattern was in a book. 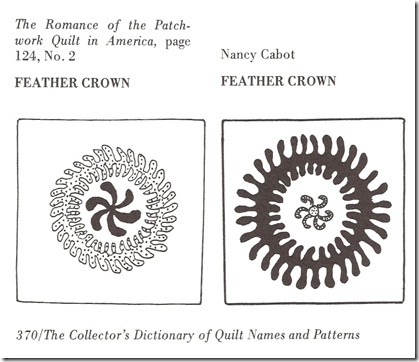 I found it long ago in Yvonne Khin’s “The Collector’s Dictionary of Quilt Names and Patterns.” As you can see below, I drafted my own pattern. I liked the image on the left, where the feathery swirl in the center just about fills the center. The one on the right just makes it seem too lost, floating in the middle. I’ve done a search online for the pattern and could not find any reference to it other than to a little wallhanging I made some 20 + years ago. Last night before I went to bed, I put all four blocks together and took their collective pictures. I’m really liking how this looks! Tonight if time permits, I will sew them all together and put one of the little feather swirls in the center to join them. One of the large feather wreaths would fit in the center, but I want to quilt a feather circle around it. Ahhhh, the border… what shall I do?